Santa Claus arrived Friday, Dec. 1, 2017, at the Hidalgo Festival of Lights aboard his sleigh. 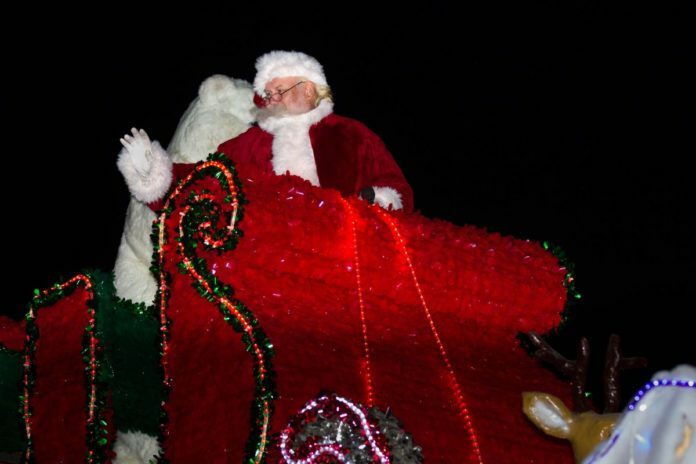 The streets were cleared for miles along Ramon Ayala Drive in anticipation of the Illuminated Light Parade in which thousands of spectators sat on bleachers and foldable chairs brought from home to observe the annual spectacular. Many sported Santa hats. Robert Gomez, a Mercedes native, was in attendance with his wife and three young children. Before the parade began, his impression was the event looked a lot bigger compared to last year. “I just like Christmas; it’s my favorite holiday,” said his son, Rolando, who was especially impressed by the decked-out, fully lit home of Ramon Ayala, who will be hosting a posada later in the month. Speakers set by the dazzling archways blasted Christmas music. With classics and more modern tunes such as Justin Bieber’s “Under the Mistletoe” being played, every generation could hum along in enjoyment. Military representatives marched in unison, carrying the Hidalgo, Texas and U.S. flags. Trailing behind, dozens of unique floats made their way along the parade route. Participants with a supporting float shared grins, waves, “Merry Christmas” wishes and handed out stickers to young ones. Apart from the first day of the festival, many more exciting events are set throughout the month. “If you come one day, the next day you come in it’s going to be different,” said Carlos Rodriguez, a volunteer who is marking his third year operating the small train that takes children around all the lights and scenes. Raziel Cano, marketing director at State Farm Arena, was pleased with the turnout and said his expectations for the event were exceeded. He praised the city departments which do the groundwork and have worked behind the scenes for over three months preparing for the festival. With palm trees wrapped in Christmas lights and cool weather not a degree below 70, the evening felt like a true Valley Christmas.